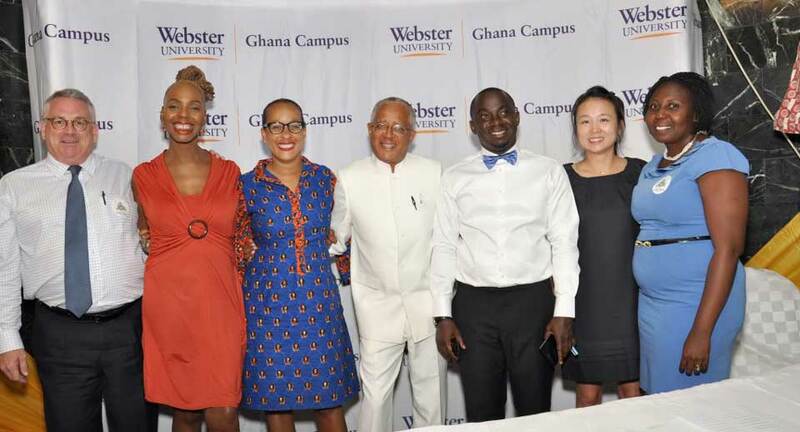 Webster faculty and staff with keynote speaker Mike Nyinaku (fifth from left) at the lecture, Global Citizens in Africa – Leading the New Century (left to right): Tim Malloy, Esther Armah, Christa Sanders, Michael Williams, Suweon Kim, Martha Amankwah. As part of celebrations to mark Webster’s centennial year, the Ghana campus hosted a public lecture, Global Citizens in Africa – Leading the New Century,at the Alisa Hotel in Accra on Nov. 4. The lecture provided a platform for lively discussion on how education and the concept of global citizenship can be used to assist aspiring African leaders who will propel the continent into the new century. Discussions centered around the core program areas of Webster University Ghana: Management, International Relations and Media Communications. Keynote speaker Mike Nyinaku, chief executive officer of Beige Capital, said in order for Ghanaian companies to compete with global giants, it was important to move away from the culture of subsistence entrepreneurship; rather, SMEs should focus on expanding to become sub-systems of the economy. Other speakers at the event included Webster’s international faculty members Michael Williams, Timothy Malloy, Suweon Kim and Esther Armah. Distinguished guests at the event included Daniel Asiedu, chief executive officer of Zenith Bank, along with members of the expatriate community and other stakeholders in business and academia.